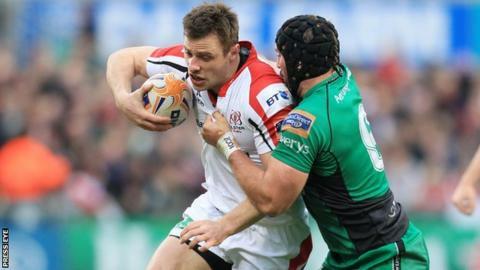 Ulster boosted their chances of a home semi-final in the Pro12 play-offs with an eight-try demolition of Connacht. Andrew Trimble scored three tries, Paul Marshall two and Tommy Bowe, Luke Marshall and Craig Gilroy one apiece. The bonus-point win came on the back of last week's agonising Heineken Cup quarter-final defeat by Saracens. Mark Anscombe's side face testing games against Glasgow and Munster away, plus Leinster at home, as they aim to secure a place in the last four of the Pro12. Paddy Jackson kicked two penalties and five conversions, and replacement James McKinney one conversion, as Ulster dominated the match throughout and moved up to second in the table. Tries in either half from Dave McSharry and Darragh Leader were scant consolation for the outclassed visitors. Diminutive scrum-half Paul Marshall set the tone for the evening when he picked the ball up and rode a tackle, before stretching over the line for the opening try in the fourth minute, Jackson missing the conversion. Connacht responded four minutes later when McSharry got over in the corner after some good work by Robbie Henshaw, who provided the decisive pass following multiple phases of play. Dan Parks failed to convert, with Jackson nudging his side back in front with his first successful penalty attempt. Paul Marshall, Gilroy and Jackson played their part in a fine sweeping move among the backs, setting up Trimble to dive over in the left corner after 15 minutes. The in-form Trimble turned provider soon after when he broke through the Connacht line and fed Bowe, who galloped clear to score try number three for the hosts. Jackson knocked over his first conversion, the ball cannoning off the upright before going between the posts. The bonus point was in the bag after just 25 minutes when Trimble took a quick line-out and Paul Marshall showed a superb burst of speed to dart clear and touch down. Jackson added the extras and then a penalty as last year's beaten Pro 12 finalists led 30-5 at the break. Trimble's second try came just two minutes after the interval, the winger running more than half the length of the pitch to score after Bowe picked up a misplaced Connacht pass and found his Ireland team-mate. Jackson extended the lead to 32 points with the conversion before he and Bowe played their part in the move which led to Luke Marshall crossing on 48 minutes. Ulster continued to pile on the pressure and replacement Michael Swift was sin-binned after Connacht repeatedly infringed as they attempted to stem the tide of attacks on their line. Trimble's hat-trick try was a simple one as Nick Williams picked the ball up from a scrum and Michael Heaney fed Trimble, who powered over the whitewash. Jackson converted, but Connacht then broke away and McSharry's run and well-timed pass set up Leader to run over for a second try for Pat Lam's side. Miah Nikora added the additional two points. With 13 minutes remaining, replacement number 10 McKinney executed a clever kick into the corner and Gilroy won the race to the ball to score his team's eighth and final try, McKinney getting his name on the scoresheet with the conversion. Ulster: R Andrew; A Trimble, T Bowe, L Marshall, C Gilroy; P Jackson, P Marshall; A Warwick, R Herring, R Lutton, J Muller (Captain), I Henderson, R Diack, C Henry, N Williams. Replacements: N Annett, T Court, A Macklin, L Stevenson, S Doyle, M Heaney, J McKinney, S McCloskey. Connacht: R Henshaw; T O'Halloran, E Griffin, D McSharry, F Carr; D Parks, K Marmion; D Buckley, J Harris-Wright, R Ah You; A Muldowney, M Kearney; J Muldoon (capt), E Masterson, E McKeon. Replacements: D Heffernan, R Loughney, F Bealham, M Swift, A Browne, F Murphy, M Nikora, D Leader.